Calling geese has never been easier. The goose calls on the market along with modern full body decoys are enough to swing even educated birds your way. If you haven’t bought or used goose calls in the last ten years, a lot has changed. 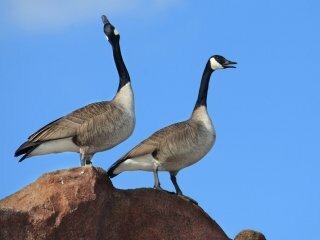 There are two basic kinds of honker calls and both serve a distinct purpose. Flute style calls are longer, easy blowing calls that produce a good sound without too much time involved in the learning curve. Most hunters these days are blowing short reed goose calls. Short reed calls are relatively new on the scene and produce an amazingly accurate goose call. In fact a good short reed caller can reproduce almost any sound and tempo a goose or even a flock of geese can make. The trick is that short reed calls require some learning to operate at all. If you blow into the first kind, a flute style call, something goosy comes out the other end. Blow into a short reed call without proper technique, on the other hand, and the sounds coming out the other end won’t be recognizable at all. You might even think you’ve been fooled by the waterfowl equivalent of a snake oil salesman. Short reed calls depend on the operator using both hands to create backpressure by limiting the air flow coming out of the call. One hand grasps the end of the call while making a fairly tight C shape with all of the fingers. The other hand cups over and closes off the C shape. The hands effectively extend the call and become part of the calling. By using the hands to regulate air flow the caller can make a wide variety of sounds. If it sounds complicated, it is. It isn’t so complicated that you can’t do it, though. Pick up a short reed instructional video, or better yet, practice with a friend who is proficient. If you don’t have the time or inclination to learn the short reed, pick up a flute style call. You should be able to use a flute with much less practice. If you goose hunt a lot or are getting addicted, there is really no choice to pick up a short reed call and get to learning. Calls by Tim Grounds, River Forks Calls, and Bill Saunders are sure fire calls. With a little practice you’ll be sweet talking honkers all the way in.